The “Biggest Little City In The World” is an interesting place. There are top-notch casinos and sketchy places, along with shows and deals on Prime Rib dinners. But I’d suggest, one interesting way to experience Reno is to park at a casino and hit the streets. Spend an hour wandering the streets, and you’re guaranteed to see a whole lot of interesting places and people. Reno provided a nice break from driving, on a day when I needed to cover 400+ miles. I started the day in Klamath Falls, Oregon, not far from Crater Lake National Park. I headed south on Oregon 39, which became California 139 at the state line. At Susanville, California 36 took me over to US 395, which took me all the way to Lee Vining, California — my stop for the night. Along the way, US 395 crosses over into Nevada, passes through Reno, then heads back into California. I parked at the Cal-Neva casino, on Virginia Street in the middle of Reno’s strip. The Cal-Neva always tempts me with an incredible deal on prime rib – and once I receive my order, I realize why I swear I’ll never get it again. It looks delicious, but it’s paper-thin. So, I ate my steak and dropped a few dollars into a slot machine, which I figured was a reasonable payment for my parking space. Then, I headed out of the casino, and wandered the streets. 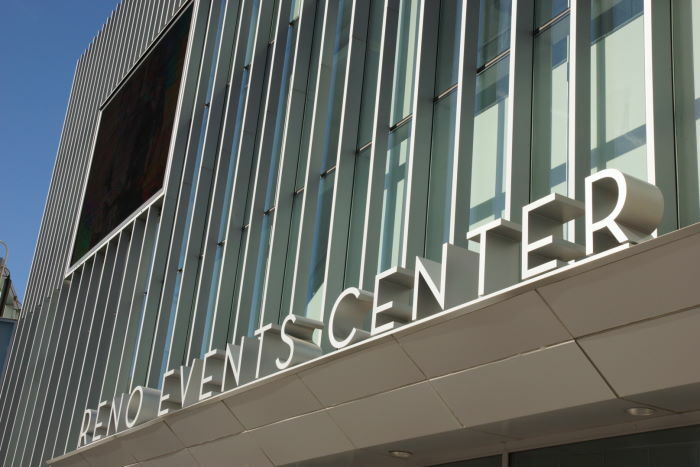 Reno has a few very nice, fancy casinos, but as soon as you step outside, you’re in the real Reno — a little dirty, somewhat seedy. I never felt threatened by anyone, but I kept a close eye on my surroundings. Reno’s streets are filled with smaller gambling halls, along with pawn shops and older motels. And I love older motels, because they usually have some funky signage and beautiful neon. Reno did not disappoint. As you’ll see as you flip through the slideshow of photos at the top of the page, it was very easy to find a lot to photograph. This is the National Bowling Stadium. Who knew there was such a thing? I guess bowlers do, but I didn’t. Underneath that big, shiny sphere you’ll find 78 lanes. 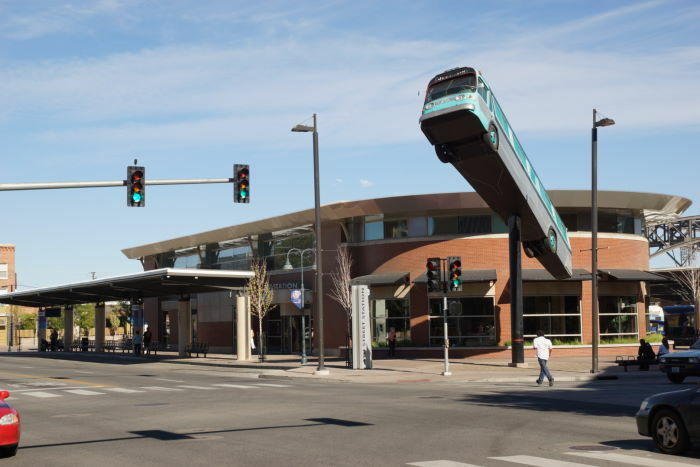 … and you’ll have no problem finding the bus station. It’s right under the huge bus that’s taking flight. 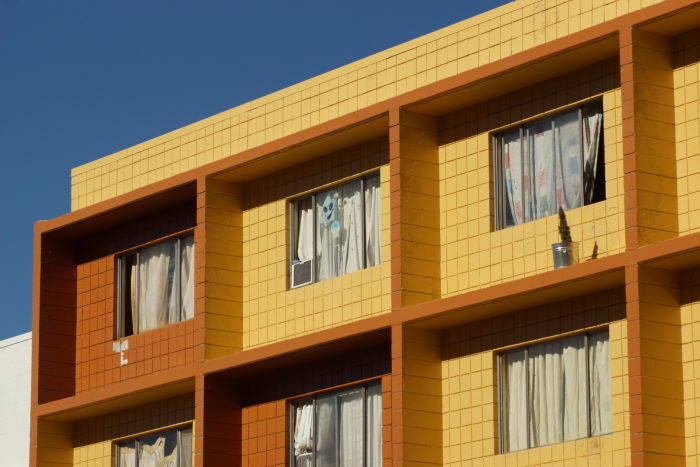 There are so many interesting motels to see. 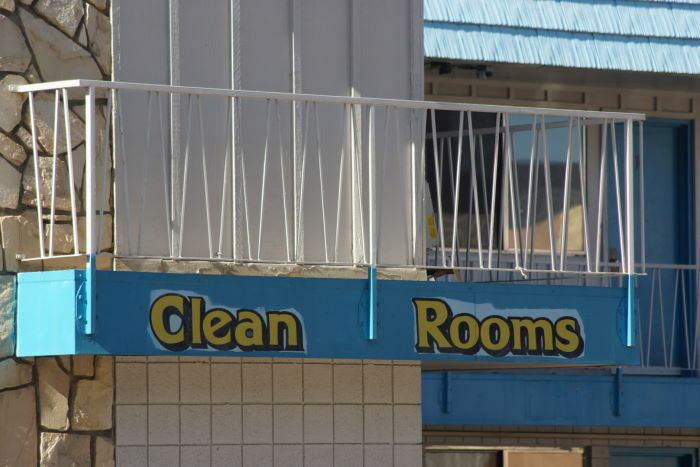 I like how, at this location, they obviously decided to paint the place, but they didn’t want to have to repaint the “clean rooms” sign, so they just painted around it. At this one, it looks like one of the residents is growing a tree on his “balcony”. That guy watched me out his window for a long time. 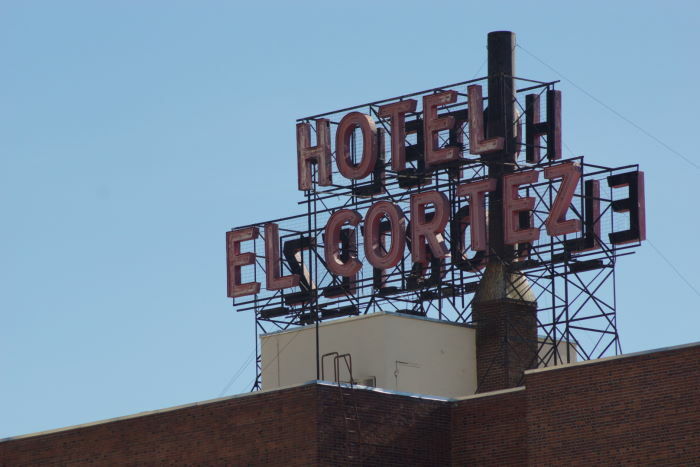 The El Cortez has a fantastic history. The art-deco building has been around since 1931, and it was the tallest building in Reno when it opened. It was built, in part, to capitalize on Nevada’s divorce laws — you could get a divorce in just six weeks, so people would come to Nevada and live there to run out the clock. Nowadays, it has a lot of long-term residents, and one of the worst ratings in the city on Tripadvisor (along with numerous horror stories from guests). So, you’re best to enjoy it from the outside. Reno is a fascinating town. Take some time to walk around and get a feel for the city’s character, both good and bad.